Thank you to the Michelle Lynn Holsey Foundation for offering a $2500 scholarship to 2019 graduating seniors. Due date for application is April 22, 2019. Click here for application. 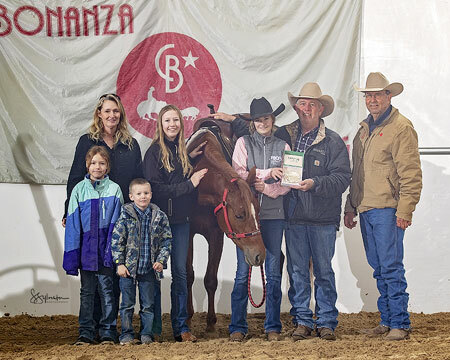 to our very own Jessie Floyd who was named champion of the 4 Year Old 50K Amateur at the Bonanza. Jessie was 6th in the finals draw riding Smooth Lil Kit Kat. Jessie’s parents are Travis & Sara Floyd from Booker, TX. Jessie rides with Ralph Depew. We could not be more proud of her. Election of officers & directors ended January 30. Thank you to all members who took the time to cast a ballot. Ralph Depew will lead the club again with Don Johnson to help him. The director races were very close, with only a couple votes separating the candidates. Congratulations to Kent Courson & Tara Zamora who will be filling the vacant positions. Contact information for your officers and directors can be found on this website under CONTACT US. Remember this is your club. Any and all ideas and suggestions will always be appreciated and taken into consideration. We are all working to make this a better club. 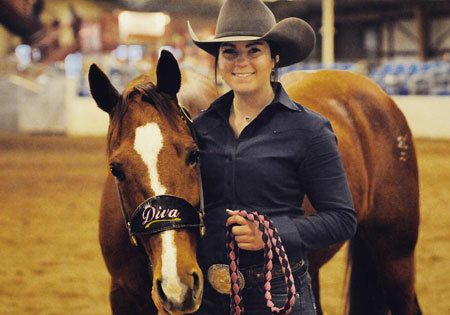 Palo Duro CHA & Panhandle CHA are once again joining together to offer Jeff Smith saddles in all classes. You must show in 60% of all shows produced by Palo Duro CHA & 60% of all shows produced by Panhandle CHA. Go to panhandlecha.com for PCHA dates. Palo Duro dates are located on this website. Congratulations to our very own Tammy Penn who was recently featured in a Texas Country Reporter episode. Click here to watch! To say I’m honored to be inducted into the NYCHA Hall of Fame is an understatement. This was by far one of my biggest goals as a youth competitor and I couldn’t have achieved it without the help of so many. I first want to thank my parents for all of the long drives, late nights and early mornings we spent traveling to shows. Not only that but for providing me with the incredible horses I’ve had the privilege of showing. My boyfriend Seth who has been by far one of my biggest support systems. My two little sisters who have been another one of my biggest support systems and for always being the ones that cheer the loudest. My Uncle Mike for hauling us when my parents couldn’t and to not only him but my cousin Jason and my Aunt Vicki for everything they’ve done. The rest of my family who have supported me at shows, especially my older brother Steve who traveled all the way down to Fort Worth with us to watch me get inducted. My trainer Nate Miller who has taught me so much, helped me out, and has truly been like another older brother to me. Everyone who ever sat in my corner or turned me around. And finally to the few amazing horses I showed as a youth competitor. Gun Slingers Mate aka “Checker” as my first cutting horse who carried me to multiple finals and always stepped it up each year I advanced. And Purely Badger aka “Diva” who is one of, if not the best horses I’ll ever have the opportunity to swing a leg over. From carrying me to multiple finals, to 4 world finals qualifications, 3 of which finishing in the top 10, to youth championships, to a national championship, and so many others. This organization means the world to me and I am beyond blessed to have been selected for such an honor.